Can we split the lamb and the whole snapper in chili sauce? I'd get a duck salad, spicy, if they have it... yum. Thai and indian food -- two of my favorites. Got to try. Green Curry is so much better. This place just couldn't stand up to all the other options in the area! also, there were some suspicious sanitary conditions...Do you really want to know the details? enough said. 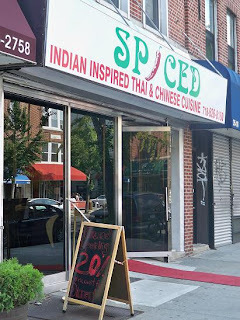 i was checking out spiced reviews on the net and every where i see shannon writing the same review.. hmm... thats kinda fishy.. dont YOU think so shannon? it isnt really mature to trash someones business with lies if you have personal issues against them.